I have a confession to make (no, don’t worry, it won’t be as scandalous as my recent Skeletons in the Pantry post…!). It’s just that I’ve never really liked Christmas pudding. I know – it’s kind of freaky, but there you go. While everybody else looked forward to the Christmas pudding as the highlight at the end of the Christmas lunch, I’d be thinking “hmmm, I wonder if I can ask for a double scoop of neat brandy butter if I forego the pudding?”. To me, Christmas pudding was just an obstacle to overcome in the search for a 5 cent piece or two that my mom always hid in the pudding. Over the years, I have learnt that there are Christmas puddings and Christmas puddings. I have developed a grudging liking for ones that are heavy on the fruit (but not citrus peel!!) and low on the actual dough, or ones that feature more exciting ingredients like cranberries. But given a choice, I would never make or serve Christmas pudding myself. So what to do when you’ve invited some friends over for a pre-Christmas lunch, the roast is in the oven, the weather is simply freezing, and the whole scenario is just crying out for a hot baked pudding with a festive twist? Christmas pudding would be the path of least resistance, but I decided instead to beat a brand new path through the culinary brambles. Requirement 1 was that it had to be a baked pudding, preferably self-saucing. Requirement 2 was that it needed to reference the festive season somehow. And bonus requirement 3 was that it use up some of the random leftover baking ingredients cluttering up my kitchen counters as we speak. Which is how the glorious creation pictured above came about. 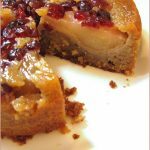 The recipe is an adaptation of my basic and beloved self-saucing apple caramel pudding, substituting crystallised ginger and dried cranberries for apple, and adding a bit of spice to the batter and sauce with ground ginger. As we were 7 people and the recipe really only feeds 5 comfortably, I decided to double it. Without cheking that I had a dish big enough to hold this. Suffice to say I almost did. Meaning that the syrupy sauce ended up bubbling over a little and landing on the floor of my oven – cue belching, acrid smoke as I opened the oven door 40 minutes later, and a lingering eau de charcoal in the house. Also, if you are going to double the recipe, you will need a longer cooking time, as I discovered. Possibly not double the cooking time, but definitely 1.5 the time. The combination of tart cranberries/ginger, crispy crust and rivers of caramel sauce is a winner – at Christmastime or anytime! Preheat the oven to 180C and grease a 2 litre oven-proof dish. Combine the flour, sugar, butter, ground ginger, milk and fruit in a large bowl and mix well. Spread the mixture into the prepared dish. For the sauce, combine all ingredients in a small saucepan over medium heat. Stir until the sugar is dissolved and the butter melted. Pour the caramel sauce slowly over the back of a spoon over batter in dish. 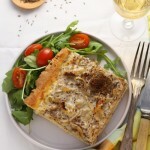 Bake in a moderate oven for about 40 minutes or until firm in the centre – test with a skewer. Serve immediately with custard. Do not let the pudding stand too long before serving as the sauce will be absorbed! This is my entry into this month’s Sugar High Friday event, hosted by the lovely Zorra at 1 x umruehren bitte. The theme is puddings – and who can resist those?! Are you implying that it’s wrong to eat brandy butter direct from the tub… by the spoonful… ? I really love this idea! Every once in a while you find a recipe that just hits the mark completely. I am not a huge fan of heavy Christmas puddings after an already huge meal. This would be wonderful…bookmarked! I’m happy I’m not the only one who is sometimes curing the kitchen. 😉 Your Pudding looks delicious. Thank you for your particpation in SHF and merry Christmas to you and your family. Oh my… a “Christmas Pudding” I can love… I’m very excited about this! But I also need your original self-saucing apple caramel pudding recipe! Please? I made this for New Year’s Eve and it was absolutely wonderful. Thank you! It’s also delicious cold … and there’s so much sauce that it doesn’t get re-absorbed. Quite a lot of the cranberries and ginger bits floated out of the sponge and into the sauce but it didn’t matter at all – just made it more delicious! This looks divine. I am a huge fan of the ‘self-saucing’ pudding and regularly make a chocolate one, a lemon one and a sticky toffee version. But this sounds like such a great and festive combination. 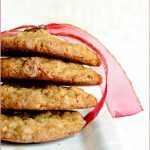 PLEASE post the recipe for the apple and caramel one too as that sounds heavenly! hi, thanks for visiting our PE Daily Photo blog. Oh dear, we are trying so hard to be GOOD and eat like bunnies since Max’s recent heart attack, but I just HAVE to try this one! Will probably have to substitute olive or peanut oil for the butter though, will let you know if it works! Fully agree about Christmas pudd, even worse when trying to force it into bloated overheated bod in the height of summer!